THIS IS AN IBANEZ IBANEZ SR300E-CCB Soundgear 4 STRING ELECTRIC BASS. Charred Champagne burst FINISH. The Ibanez SR300E 4-string electric bass doesn't sacrifice your wallet but plug it in and you might think you cleaned out your bank account. Ibanez SR300 Electric Bass. Sound Gear. Black Sparkle Finish. For 30 years the Ibanez SR has given bassists a modern alternative, and continues to answer the needs of a variety of players at a variety of budgets. No gig bag is included. THIS IS AN IBANEZ IBANEZ SR300E-NPM Soundgear 4 STRING ELECTRIC BASS. Designed by Ibanez, Equalization chores are handled by Ibanez Custom Electronics 3-band eq. The Ibanez SR300 4-string electric bass doesn't sacrifice your wallet but plug it in and you might think you cleaned out your bank account. Equalization chores are handled by Ibanez Custom 3-band EQ with Power Tap switch. SR300E 4-String Electric Bass. First off, it has a 5-piece SR4 maple/rosewood neck and light, mahogany body with smooth rounded edges and a deep, lower cutaway for better access to the upper frets. Ibanez SR300E! For 25 years the SR has given bass players a modern alternative. With its continued popularity, Ibanez is constantly endeavoring to answer the wider needs of a variety of players, at a variety of budgets. This is an Ibanez SR300DX Electric Bass Guitar. In good shape and plays great. 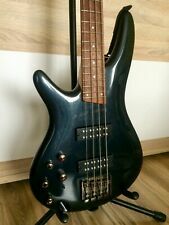 Ibanez Ibanez SR300E NPM SR Standard Electric Bass Guitar. For 30 years the SR has given bass players a modern alternative. With its continued popularity, Ibanez is constantly endeavoring to answer the wider needs of a variety of players, at a variety of budgets. MPN: SR300EB WK. Ibanez SR300EB 4-string Bass Guitar - Weathered Black - QTY 1. Ibanez SR series 4-string electric bass guitar in weathered black finish. Ibanez IBB101 Bass Guitar Gig Bag - QTY 1. This basic strap is a great match for any acoustic guitar, electric guitar, or bass guitar. SKU: SR300ENPM – Manufacture: Ibanez. Ibanez Custom Electronics. For 30 years the SR has given bass players a modern alternative. Embraced by bassists over the decades, the iconic series continues to excite with its smooth, fast neck, lightweight body and perfectly matched electronics. Double Cutaway. Body Shape. Number of Strings. Right Handed. Right / Left Handed. Other features include a sturdy 5-piece Maple/Walnut SR4 neck, a Jatoba Fingerboard, and an Accu-cast B120 bridge for superior string vibration transfer and precise intonation. Cosmo Black hardware adds a hint of stealth. WE ARE AN AUTHORIZED IBANEZ DEALER. For 25 years the SR has given bass players a modern alternative. With its continued popularity, Ibanez is constantly endeavoring to answer the wider needs of a variety of players, at a variety of budgets. SoundGear SR300DX. The Maple neck has a contoured bolt joint and a Rosewood fingerboard. Active Electric Bass Guitar. Includes: electric bass guitar (original electronics cover and case/gig bag not included). 2018 Ibanez Soundgear SR300el 4 String Bass LEFTY; Iron Pewterfinish; no case included. Bass is in excellent! No fretwear. Straight neck. Plays great. Thunderous tone. Photos are of the actual guitar for sale.